NETDRAW is a program for the graphical input of electrical networks. The program is running on a PC under all Windows versions. NETDRAW supports the languages german, english, french, polish and portuguese. After input or changing of network data the load flow and short-circuit calculation with LAKU can be called, to calculate the results. 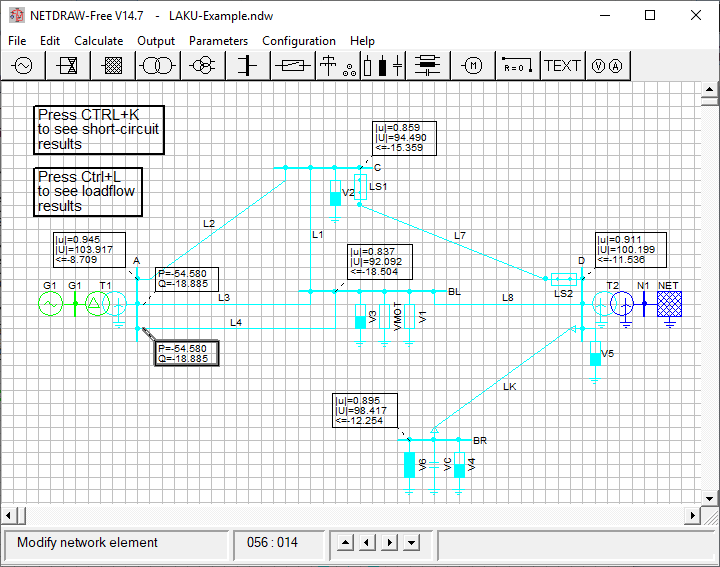 From NETDRAW version 11.00 LAKU is integrated fully in NETDRAW. The free available version NETDRAW-Free may be used educational purposes only. There is no legitimation for commercial use. Modifiying of the program code is not allowed. No garanty for the quality of the results is given. The program may be distributed without any fee with regard to the limitations above. The commercial version NETDRAW-Light is available for registrated users only! If you want to get informations about updates and news, fill in the User-Registration. Look for Netdraw users around the world (references).